More flavorful than I expected given the few ingredients; I think slow-cooking the squash with the apple and onion gave it a sweetness different from many butternut squash soups I've had before. I did use Greek yogurt instead of heavy cream as I wanted to keep it healthier and lower in fat, but would definitely use the cream for a richer flavor and texture in the future. I loved the way this soup turned out. The 1/2 cup of heavy cream, apple slices ( I used Gala), and nutmeg enhanced the squash. I took the author’s suggestion and made ham sandwiches (with hearty Rustic bread, tomato slices, mustard, mayo) to go with the soup, and that was a great pairing. Definitely will repeat. Husband really liked this. Very easy to make, especially if you have pre-cut squash. Looking forward to the leftovers and second day soup flavor. I loved how the slow cooked spices, peppers, and tomato sauce flavored this chicken dish but my husband thought it was on the bland side. I didn’t have Piment d’Espelette so I used smoked paprika as recommended. This was easy to put together and nice to come home to and serve after a day out. The sauce consistency was surprisingly thick, chunky, and hearty, not at all mushy like some sauces get in slow cooking. Served with white rice. We liked this one quite a bit. I prepped everything the day before, up through browning the meat and deglazing the pan. Threw it all in my crockpot this morning before work and finished when I got home, along with boiling some red potatoes to serve on the side. Rich flavor; the orange really came through and the olives kept it from being too sweet. Will happily make again. An easy and flavorful slow cooker recipe. Brown the beef, toss the rest of the ingredients in, cook on low for 8 hours. I used 3 sprigs of rosemary rather than one. A warming winter dish I will make again. Very, very good. I started this the day before—browning the meat and onions, assembling everything to just throw in the pot the next morning to cook all day while at work. Finished with the mushrooms sauteed at the end and also added some boiled small potatoes before serving. Had a nice richness of flavor and was definitely one of the better slowcooker beef stews I've made. I did add a few other fresh herbs from my garden, including some sage and oregano. Very easy, and flavorful for a slow-cooker meal. The olives and orange peel added at the end definitely brighten up the flavors and the sauce is delicious. Definitely serve with crusty bread as suggested or mashed potatoes. Really enjoyed this. I made it with lamb, as specified, and I think it's definitely a must to get the right taste and richness. The sun-dried tomatoes were interesting and I think worked really well to enhance the flavor of the stew—so many slow-cooker stews can be bland and texture-less but these were really good here. I might add some dried porcini next time, too. Overall easy to throw together and a stew I would absolutely make again. Very Good but I ended up steaming the broth and mussels on the stove in my soup stock pot because my slow cooker was taking a long time ( beyond 20 minutes) to steam open the mussels at the end. Recipe says 20-30 minutes for mussels but why wait when you can steam them for 5 minutes? The slow cooker definitely creates a wonderful broth. Next time, I’ll make the tomato broth in the slow cooker, then transfer it, the mussels, and Pernod to my stock pot for the final steaming of the mussels. The Pernod makes this a wow. Served with baguette and a green garden salad. Really nice comfort food on a winter night. There are a few reasons to turn to Scicolone’s book rather than to the many other slow-cooker technique books on the market. It’s well-designed, accessible, and the recipes work. With a slow cooker, even novices can turn out dishes that taste as though they came straight out of the kitchen of a French grandmere. Provencal vegetable soup. Red-wine braised beef with mushrooms. Chicken with forty cloves of garlic. Even bouillabaisse. "The French Slow Cooker" makes all of these as simple as setting the timer and walking away. 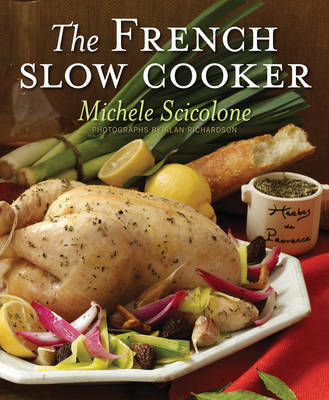 Michele Scicolone, who showed home cooks how to prepare extraordinary Italian fare in the slow cooker, now does the same for the French classics, adapting dishes from her travels all across France so they can be made with a fraction of the effort. Scicolone gives plenty of tips for coaxing the utmost out of every dish while keeping the flavours fresh. And she goes far beyond the usual slow-cooker standbys of soups and stews. How about Slow-Cooked Salmon with Lemon and Green Olives, Crispy Duck Confit, Goat Cheese and Walnut Souffle, and for dessert, Ginger Creme Brulee. With "The French Slow Cooker", the results are always magnifique.